If she were alive today would Lee Lozano be a blogger? I’d like to think so, as at the very least I think the medium would have been deeply interesting to her, its occupation with the ‘global audience’, exposure for the written word and debates on censorship and what constitutes public/private in an age when almost every aspect of people’s lives is documented online. But where are my manners?! Few people I know have ever even heard of the artist, Lee Lozano and to some extent that is exactly what she wanted, self-creating her own infamy with a body of work titled ‘Dropout piece’ whose primary aim was to reject and create self-anonymity from the art world. In succeeding to do so, but still continuing to work privately and continue her practice (in the form of copious notebooks of thoughts and experimental performance pieces) she inadvertently created a legacy in the art of self-oblivion. Born 1930 in New Jersey she graduated philosophy and natural sciences before marrying and in four years divorcing, architect Adrian Lozano whilst studying towards her Bachelors in Fine Art. In the 60s she moved to New York befriending artists such as Stephen Kaltenbach and Carl Andre in which increasingly, due to the likes of artists such as Michael Heizer and Robert Smithson, the art was beginning to emerge outside the institution of the gallery/exhibition space. This was to be influential in the development of Lozano’s later performance and conceptual pieces. IMAGE 1. Lee Lozano Installation view of the ‘Wave Series’ (1969) oil on canvas. IMAGE 5. Lee Lozano ‘No Title’ (1963-64) graphite and crayon on paper. Dimensions unknown. In her series of tool drawings and large paintings tools are depicted with great intensity, often in extreme close-up with a very physical use of mark-making. IMAGE 3. Lee Lozano ‘No Title’ (1963-64) graphite and crayon on paper. Dimensions unknown. 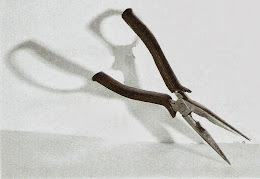 In my own work (IMAGE 4) the tools I depicted were nearly always unconsciously in groups or sets. I like to think this was a compositional decision; that the positive and negative shapes created by layering/overlapping the tools more interesting visually than drawing them statically or in rows. However, the large scale and intensity with which I drew them dictated otherwise, making them often more intimidating or, similarly to Lozano personified in some way. Tools are objects of character, their patina giving them unique surfaces and whilst I did not directly respond to imbuing them with the courtship and coupling in Lozano’s drawings I accept that other people could read into them in this way. If anything it makes me want to make new work that specifically explores these ideas. 'Tools and their relationships'! Ha! IMAGE 4. Natalie Parsley. Tools 2. 2008. Oil and gloss mono print on paper. 250 x 220cm. These are paintings that intend to intimidate and are as aggressive as they are sexually direct and full of double entendre and masculinity (IMAGE 5). In their exaggerated extremity they also have many parallels with comic books that both influenced Lozano and whose word-play inspired her written pieces. But the fact Lozano is a woman depicting these heavily masculinised objects with equally masculine connotations gives them a sort of anarchic sense of taking claim or ownership of them. As a woman myself, conveniently, who has depicted tools in her art for many years now it is incredibly liberating to discover Lozano’s tool work as it openly challenges stereotypes and throws an interesting perspective on my own relationship with tools that had previously, relatively gone unconsidered. Perhaps being in a more liberal age of equality than America in the 60s I don’t see gender-equality as much of an issue regarding my own work in the sense it isn’t driven out of a desire to protest or misbehave but none-the-less after spending the majority of my tool-based art career looking at the prints of Jim Dine it is refreshing to counterbalance this perspective with a female artist. Dine and Lozano’s drawings have a similarity in their intensity of looking and use of drawing as a means of expression and almost cathartic ‘drawing-out’ which I too have frequently referred to in my own practice. This and the fact that each of them underwent bouts of psychoanalysis is evidence that there is more that unites the likes of Lozano and Dine other than just in their representation of tools. 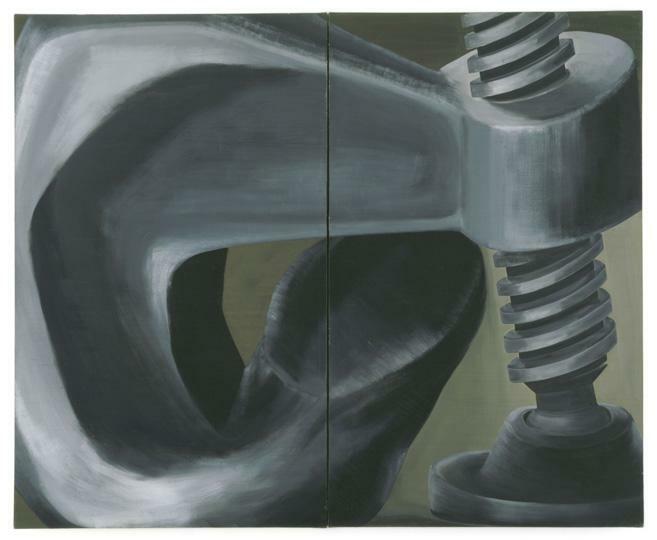 Lee Lozano ‘No Title’ (1964) oil on canvas (two parts) 275.2 x 168.5 x 5.2cm. Where Lozano differs, is that Dine’s tools are relatively more static but ‘sexually’ charged by the mark-making that surround them (IMAGE 6); Lozano’s tools are cropped so that the moving-parts of the tool, the parts with teeth, which cut, which flatten and squeeze are amplified so have this feeling of being more menacing, at times perverse and certainly more physical. In a precursor to Sol Lewitt, Lozano wrote her own list of verbs and used these ‘doing’ words as titles for her tool paintings, further underpinning associations with action/use. IMAGE 6. 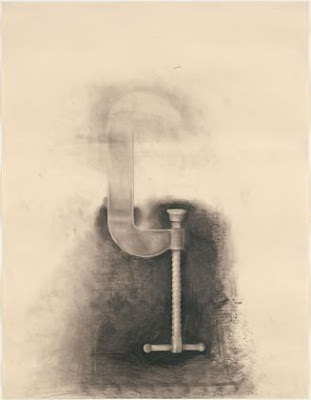 Jim Dine ‘Untitled (C Clamp)’ from Untitled Tool Series (1973). There is, I feel without doubt a rawness of emotion in both Lozano's and Guston's drawings aside from their subject matter that warrants further research than I have gone into here. I see this post as the beginning of an on-going enquiry into Lozano's work. IMAGE 7. 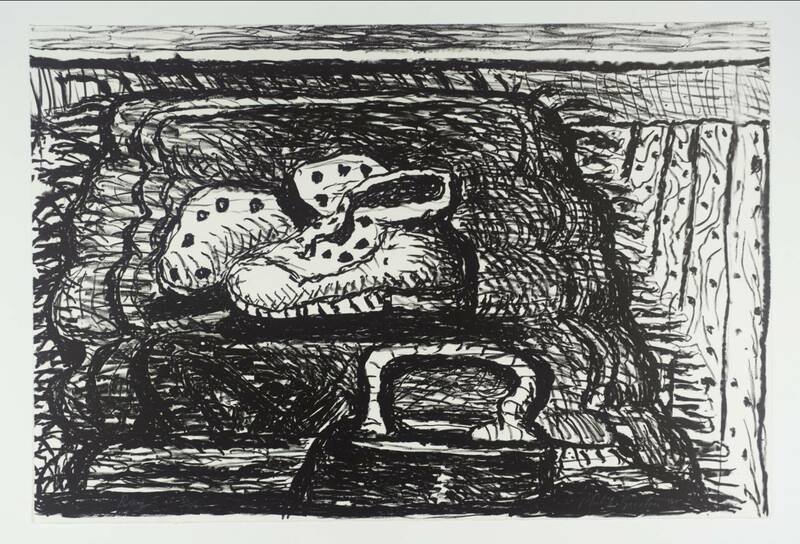 Philip Guston ‘Rug’ (1980) Lithograph on paper, 495 x 736 mm. Lozano’s tool drawings and paintings only made for a short span of her artistic career which evolved from the early tool works to minimalist paintings and later written conceptual pieces performed often in private. Despite the diversity and shifts within her practice her reasoning and resistance to any sense of categorisation within the art system and nonconformity prevailed seeking recognition and appraisal amongst her peers rather than public. Her work highlighted the dangers of expectation and assumption and demonstrated that artists are able to reinvent themselves and take on many evolutions within their practice, but most of all being admirable for not being afraid to stick two fingers up at the symbiotic, superficial relationship between artist and the art world, in fact making it into the catalyst for creating work. This path consequently led her down an incredibly self-destructive path and at times reliant on the support of friends and family which she continued to rely on up until her being diagnosed for cervical cancer which she died from in 1999 (she was 69). Yet despite her elusiveness and relatively premature death her work went on to influence a generation of conceptual and performance artists working in America and thanks to the preservation of many of her works, countless since. I have known of her work since 2011, first discovering her in a book on drawing –since then I have felt obliged to unveil some of the mystery and have continued to seek her work out in exhibitions and in books. I still want to find out more, captivated by both the shifts within her practice, her mystery and determination met with anarchy against the establishment. That and the tools, of course! 7 DINE, J (2005) Jim Dine: Tools and Plants Alan Cristea Gallery: London p5.